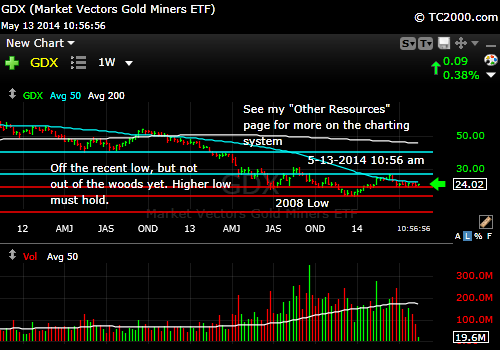 Please refresh the page to see the latest post on the gold miners. 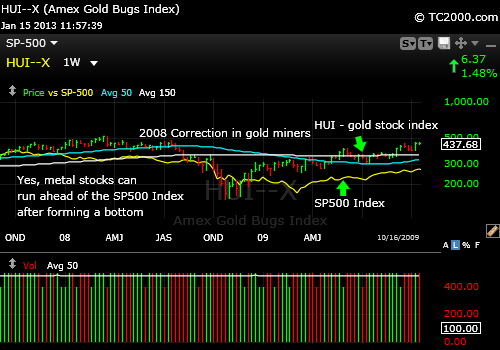 The newest information on gold and the miners will be in the free newsletter out after the end of every market week. 7-19-2015 GDX is now below the 2009 low. Gold is testing below an important support level. Rates are moving in the right direction, but the U.S. dollar is not; it is strengthening. Panic demand for gold is subsiding following temporary resolution of the Greece crisis, even though that is far from over. One more thing. Could you please "Like" this page below on Facebook? Thanks. Thanks to Worden Brothers for the charting software used to create all my charts. See "Other Resources" on the blue bar to the left above for a risk free trial. 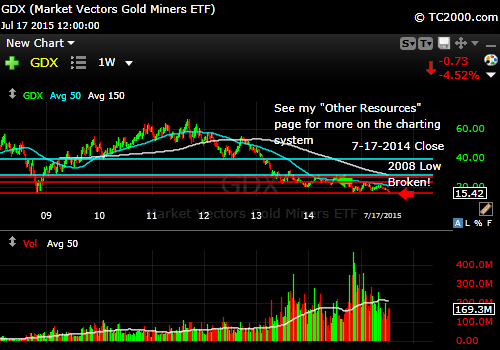 5-12-2014: GDX is up off a recent low, but must hold the current consolidation range or it risks a retest of the prior low or even the 2008 low (bottom red line in chart below). The gold miners are consolidating below the important 2012 lows after attempting a breakout two days ago. Even Dr. Bernanke's testimony was not enough to goose the gold stocks. Until we see strength above that bottom red line, there is no point in buying. Take a look at the chart if you want to see "where not to buy" on a chart. 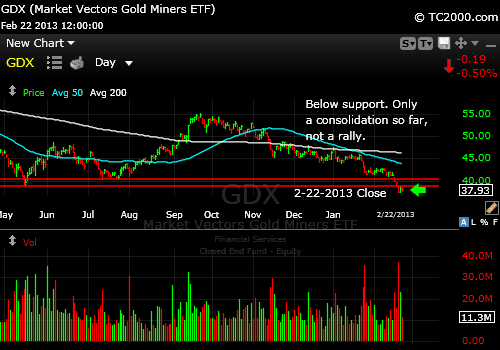 The gold miners broke over the past few days, and there is no support even close to here. 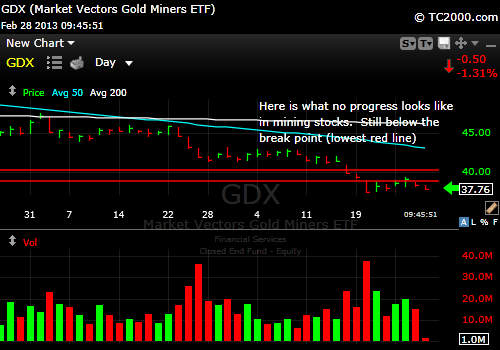 This means, GDX needs to either reverse up quickly or it will suffer even more damage. So far at this level, all we have is a consolidation. The reversal needs to be above the bottom red line on the chart below just to breathe some life into the gold stock trade. One more thing. Could you please "Like" this page above on Facebook? Thanks. 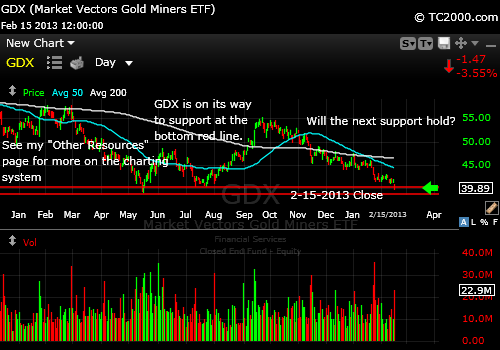 The first stop for the gold miners is the bottom red line in the chart below. If gold does not hold one of the support levels shown in this week's GLDTracker™ the damage could extend itself even more. One thing that could do that is discussed on the homepage this week (see top of blue bar to left). I discuss my targets in this week's free newsletter. See subscription box to the right. I reviewed the weakness in the gold sector in this week's free newsletter published yesterday. So what does the gold stock ETF (GDX) look like today? The GDX which tracks the HUI gold stock index (except when dividends are distributed, so pay attention to the ex dividend dates - true for all ETF's by the way) has reversed above a set of significant lows after forming a double bottom just below that level. The gold stocks look as though they may finally rally. A close back below the prior two lows would temporarily negate this idea, so decide where you will get out. It is wise to do that before placing a trade. And check out my "Buying Checklist" page if you haven't (see blue bar). I do not like to be too early. So sometimes I look for confirmation from another index. 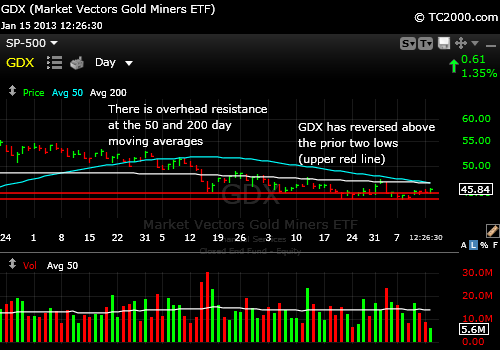 My other requirement for buying GDX ETF was that GLD be above 162.30 as discussed at the GLDTracker™ link below. I am not interested in owning gold stocks when gold is going down and finally, it may not be. Let's see if there's good follow through over the next few days. Please note that this is a trade only as there is overhead resistance and commodities tend to trade with big swings up and down. Gold won't be favored forever in terms of being a fixed investment. I know that many feel otherwise, but my preference is to have a trading position in gold and a longer term position that I hold until I see the signs of the end of the long Bull market in gold. Could you please "Like" this page above on Facebook? Thanks. All charts are produced via TC2000.com which is a registered trademark of Worden Brothers, Inc., Five Oaks Office Park, 4905 Pine Cone Drive, Durham, NC 27707. Ph. (800) 776-4940 or (919) 408-0542. www.Worden.com. Please click on the link on my Other Resources" page for more information. Join the Wait List to Join the Newsletter as a Loyal Subscriber, Opening again for the October 4th issue. If you join and don't read the newsletter, you will be deleted. Why? I don't publish to non-readers as other newsletters do. I surround myself with committed people who value what we are doing. Stay tuned here in the meantime and follow all the action via the Twitter® links below.